WHRRI opened the 2012 season this past weekend so I stopped by Sunday afternoon to catch some of the action. Hit the jump for more pictures of Groups one (FC and DSR) and two (SM and SN) Sunday Feature. The Spec Neons were six cars deep which is a pretty good showing for the class and motivation to get my old car back on track. Sean Grogan finally made the leap from autocrossing to real racing and made a strong showing in the feature with a win and a fast lap of 1:21.1. 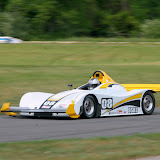 WHRRI Race two takes place June 8-9.